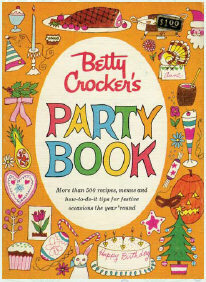 This faithful reproduction of Betty Crocker's Party Book will be a treat for anyone who lived through the 1960s--or wished they had! Packed with practical advice, classic recipes, color photographs, and whimsical illustrations, it reveals secrets of great parties back in the era of Leave It to Beaver, most of which are still applicable today. Readers will find detailed plans for more than 30 different parties, including themed birthday celebrations (such as a Space-Age Adventure Party and Cinderella Party), holiday get-togethers (for Christmas, Halloween, and more), and wedding-related events (like a Bridal Shower and an Anniversary Party). The accompanying recipes--including Blueberry Coffee Cake, Pineapple Chicken, Brownie S'Mores, and Easter Bunny Cake--are as tasty today as they were back in the sixties. Complete with craft ideas (such as how to make a gilded fruit centerpiece) and entertaining advice ("What Makes a Hostess Famous? "), this facsimile edition is a charming snapshot of life in a more innocent era--and a perfect gift.